Machine cleaning is safer than manual cleaning as all works can be carried out from the ground. 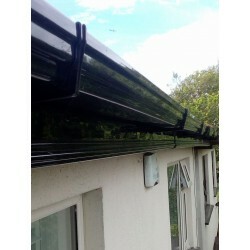 If you require Gutter Cleaning or Repaired, Collins Roofing Contractors in Dublin can provide this service. This product is worth 245 loyalty points. Collins Roofing is a local family ran business, established by Sean Collins, who has over 15 years of experience in the industry. 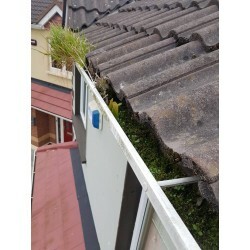 Specialising in gutter cleaning, repairs & replacement. We offer a 10 - 25 year guarantee on all our work. We can walk you through this. We offer a free quotation service. No hidden fees. Call out charge included. Flexible times. Collins Roofing will work around your diary. National Guild of Master Craftsmen. We're insured for up to 14M Euro - The highest possible grade of insurance in the Republic of Ireland. Fully Tax Compliant - Tax Clearance Certificates available on request. Once a week, Collins Roof Repairs fix a roof for a member of the elderly community. If you know someone who is an OAP and who has a leaking roof or in need of roof repair, visit Collins Roofing or Contact us for more info.